Well, Today TFL Breaking News is going to be a big one. California is overdue for a major Earthquake says, Scientists. The devastation earthquake might give up at any moment! Are you ready to face it? Scientists’ forecasts California’s next big Earthquake is coming, the leading experts state that the Southern section of California San Andreas Fault now primed for some actions. The Residents of South California warned up that San Andreas Fault is Locked, Loaded and ready to roll. 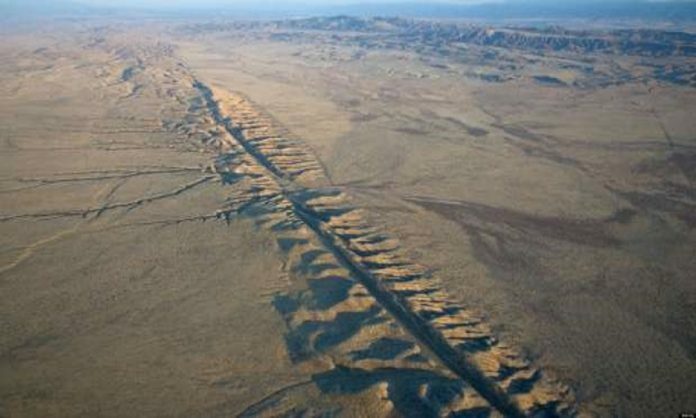 The Seismologist predicts the San Andreas Fault might get shock waves are Locked and Loaded “Ready to Roll.” The geologists start beginning worrying on the devasting earthquake which going to strike California soon. It estimates a record of magnitude 7.9 might get registered. The scientists forecast that it might get hit as which hit in 1857 with 7.8 magnitudes, presumably 159 years ago. Thomas Jordan, Director of Southern California Center speaks quoting that “the springs on the San Andreas system have been wound very, tight and the southern Andreas fault, in particular, looks like it’s locked, loaded and ready to go” which are frightening the whole region of Southern California. In 2008, U.S. Geological Survey of San Andreas told that it could cause 7.8 magnitude earthquake which tolls to 1,800 deaths, 50000 injuries and something like $200 billion in damages in Southern California areas. But the one thing they can’t agree on when it’s going to coming. What the scientists told on is we should be well prepared for 8.0 earthquake magnitude obviously that is huge. But they have been retrofitting the huge buildings, but if the big one comes, this will get a bad. The San Andreas Fault had some earthquakes in past time: exactly earlier twelve years ago 2004 park field earthquake registered a magnitude of 6.0 felt across the state which includes the San Francisco Bay Area. The 1989 Loma Prieta earthquake moment magnitude registered 6.9 about 25 miles got ruptured near Santa Cruz, California causing 63 deaths. In 1957, the San Francisco earthquake with an epicenter on San Andreas Fault ranged magnitude 5.7 in a west ocean of San Francisco and Daly City. In 1906, about 270 miles were ruptured in Northern California by San Francisco earthquake. About 3000 number died in subsequent fires and earthquake. It remains estimated EQ magnitude of 7.8. The first high EQ magnitude was about 7.9 in 1857 Fort Tejon Earthquake ruptured 220 mi in central and southern California. Previous articleFacebook wins the trademark case in China.